* then return direct; and don't go through the proxy. * no dots), then don't proxy these requests. A landing page presents useful information to the user. You must configure a landing page to be the home page of browsers used on the iOS devices connected to your network. When a browser is started on the iOS device, the landing page will redirect to the proxy server, allowing the client-side certificate to be validated. To redirect web traffic from connected iOS devices to Global Proxy, you need to provision the devices with the Global Proxy settings. Note: To configure the above, you need to download the free Apple Configurator™ app from Apple’s App Store. The Apple Configurator app allows mass deployment of profiles to iOS devices suited to corporate or education environments. 1. 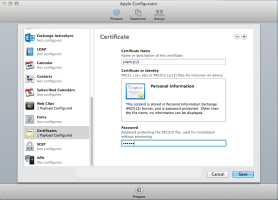 From the Mac OS X server, open the Apple Configurator. 2. Open Global HTTP Proxy. 3. From the drop down list, set Proxy Type to Auto. This forces the iOS device to use the proxy.pac file it is presented. 4. In Proxy PAC URL, enter the URL that the iOS device will use to retrieve the proxy.pac file. For more information about creating the proxy.pac file, see Creating the Proxy.pac File. 5. Ensure Allow direct connection if PAC is unreachable is not selected. 6. If users are expected to authenticate via a captive portal, tick Allow bypassing proxy to access captive networks. You must create a link to the landing page of your Smoothwall (see Using a Landing Page) to validate the client-side certificate. This link must be used on the iOS device before attempting to use the Safari browser for authentication. 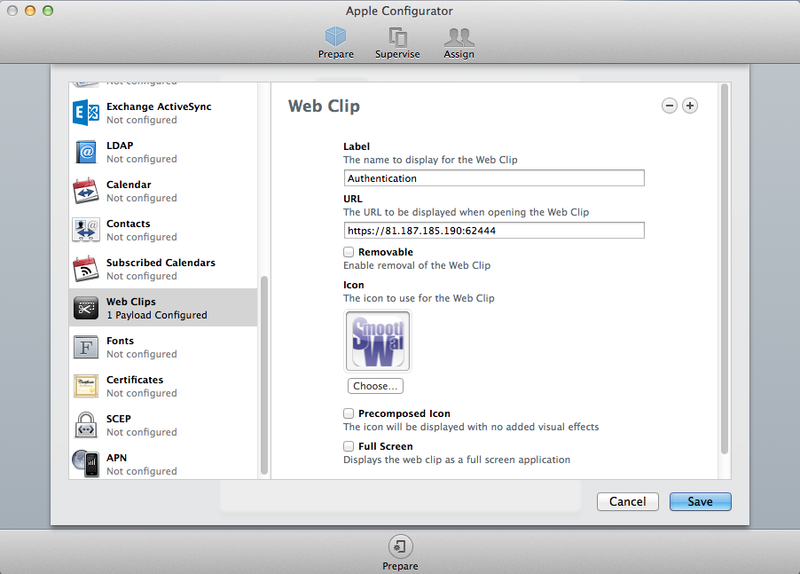 This is done in the Web Clips page of the Apple Configurator. • Icon — If you wish, you can provide an icon for the configured Web Clip. You now need to add the password that was previously configured for the uploaded client-side certificate (see Identifying using Global Proxy Certificates). 1. Download the Global Proxy certificate (client.p12) from your Smoothwall, ensuring you configure a meaningful password first — see Identifying using Global Proxy Certificates. 2. Upload this to the iOS device's internal storage. 3. From the Mac OS X server, open the Apple Configurator. 5. The client-side certificate you previously uploaded should appear in the Certificate Name box. If it does not, enter client.p12. 6. Enter the assigned password for the PKCS12 file in the Password text box. Note: If the connecting iOS device is outside the Active Directory domain configured on the Smoothwall, users will be required to provide NTLM authentication credentials after the certificate has been validated. These credentials must match the ones configured on the Smoothwall. 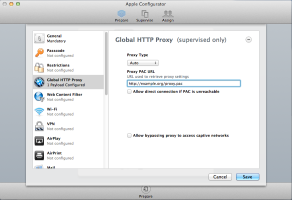 • Connecting the iOS device to the Mac OS X server, and copying the global proxy settings over. • Using the Push wireless service to push the global proxy settings from the Max OS X server out to the iOS devices. For a detailed description of how to use the Push wireless service, refer to your Apple® documentation. The following procedure describes how to configure the Global Proxy settings on a single iOS device. 2. Upload this to a web-hosted location. 3. 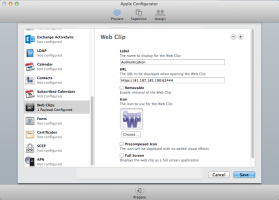 Using a Safari browser, browse to the web-hosted client.p12 certificate. 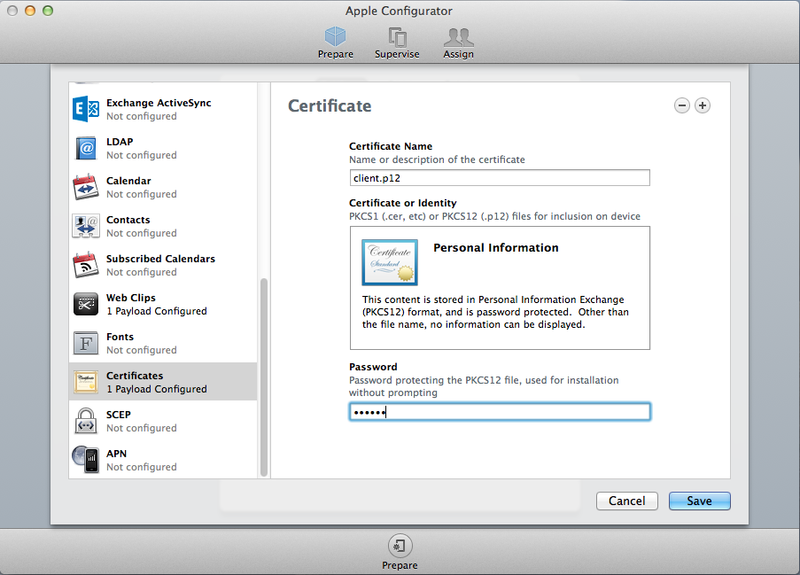 The Install Profile page will display the identity certificate. 5. If prompted, enter the device’s passcode. 6. Enter the password you configured for the client.p12 certificate to confirm the installation of the profile. 7. When completed, go to the Wi-Fi settings of the iOS device. 8. Scroll down to, and open, HTTP Proxy. 10. In the Proxy PAC URL box, enter the URL that the iOS device will use to retrieve the proxy.pac file. For more information about creating the proxy.pac file, see Creating the Proxy.pac File. 11. Click Save and exit out of the application. This validates the installed certificate. The iOS device will use the certificate as an additional layer of security. Note: If the connecting iOS device is outside the Active Directory domain configured on the Smoothwall, users will be required to provide NTLM authentication credentials when they first open the browser. These credentials must match the ones configured on the Smoothwall.